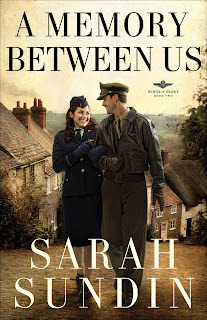 I couldn't wait to get my hands on Sarah's debut novel, A Distant Melody , and really enjoyed the WWII homefront love story. So, when I was given the opportunity to read about another of the Novak brothers in her second book, A Memory Between Us , I quickly accepted. You can tell that Sarah has put a lot of time into her research. I don't know the accuracy - I'm not a WWII plane buff - but, she writes such detail, that I felt I could imagine the plane, the flights, and the fights. While I was reading, I even told my husband that I want to visit our local warplane museum and check some of these planes out! While A Distant Melody was a sweet love story, A Memory Between Us was more serious, dealing with some tough subjects. These tough subjects made for some uncomfortable reading, and I much preferred book one, although pride and forgiveness are certainly two of my own weaknesses. Despite the hard subject matter, I had a hard time putting the book down, due to Sarah's finesse at portraying the realistic emotions and reactions of the characters. So far, both books in the Wings of Glory series are easily standalones, but I still look forward to seeing what Sarah does with the 'last' Novak brother in book three! Sarah Sundin is hosting a great Movies and Memories giveaway! Click on the above picture to enter to win a fabulous prize package that includes gourmet chocolate, British specialty teas, a Netflix subscription, and MORE! Many thanks to Sarah, through Litfuse, for sending me a copy of A Memory Between Us to read and review! Stephanie - thanks for the great review. Pride and forgiveness are tough for a lot of people - myself included :) I'm glad you enjoyed Jack & Ruth's story.